Castleisland 25 years ago, you could be talking about Fenit today ! A community that is crying out for a unused railway to be revitalised. 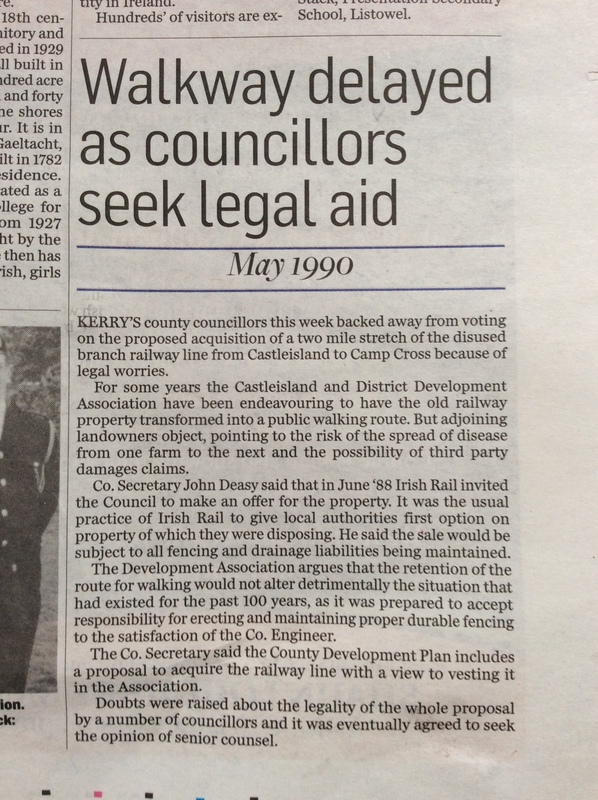 And a local authority (Kerry Co Co) sitting on their hands ! Posted in Castleisland, Great Southern Trail, history, Irish Rail, Kerry co co, media, Tralee to Fenit Cycleway/ WalkwayLeave a Comment on Castleisland 25 years ago, you could be talking about Fenit today ! A sad day for the railway, a good day for the Greenway. 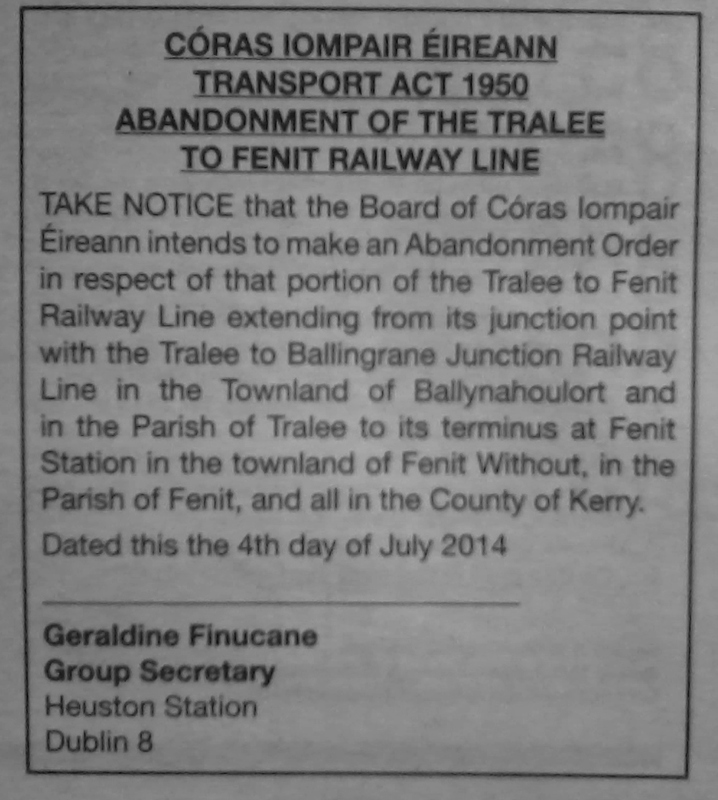 As we posted recently CIE has agreed to divest the Tralee Fenit Railway to Kerry County Council . This week CIE has posted notice of the abandonment order in the local press, this is the first step in the formal abandonment process. 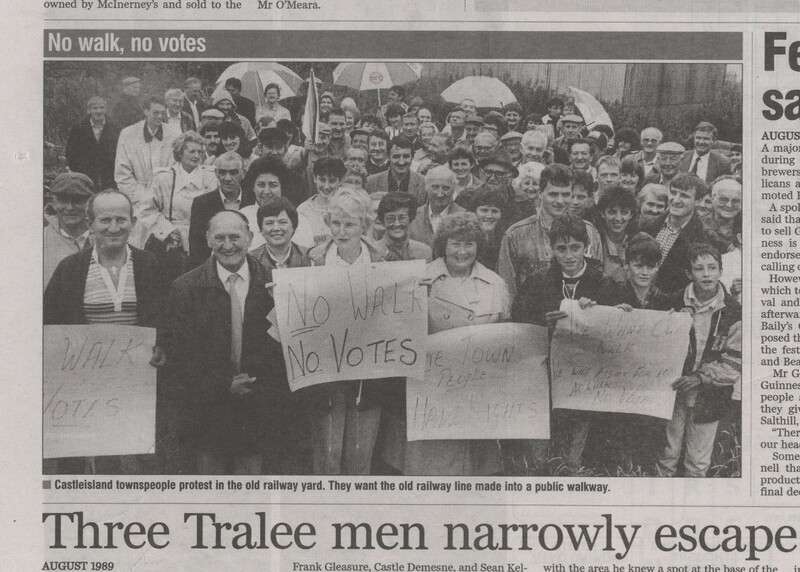 Even for avid proponents of the rail-bed conversion it is sad to finally see the railway’s life finally coming to a close, yet another part of Ireland’s once extensive railway network disappearing from the map, but there is consolation that with it’s conversion to a greenway the line will stay intact and will remain a transport route serving the people of Tralee, The Spa, Kilfenora and Fenit. As a coincidence CIE’s notice is dated the eve of the railways 127th birthday, the line opened to passengers July 5th 1887 ! Posted in eurovelo, Great Southern Trail, history, Tralee to Fenit Cycleway/ Walkway1 Comment on A sad day for the railway, a good day for the Greenway. 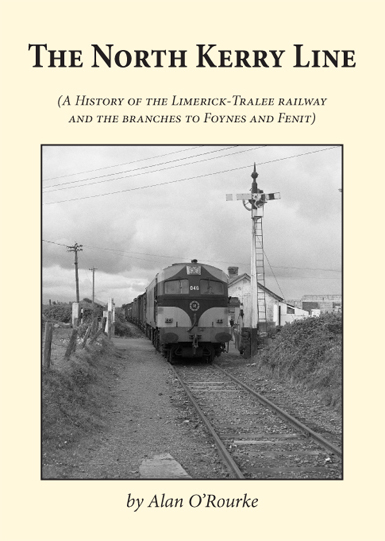 A new book by railway historian Dr. Alan O’Rourke titled ‘The North Kerry Line’ whose subject is the Limerick to Tralee railway along with the branch lines to Fenit and Foynes will be launched in the Lartigue Railway Museum, Listowel, Co. Kerry by Minister Jimmy Deenihan on Sunday 24th Nov. at 7pm and at the Library, Gortboy, Newcastle West, Co. Limerick on Tuesday 26th Nov. at 8pm by Éamon Ó Cuív T.D. The public are cordially invited to attend on both nights. Beidh fáilte roimh gach éinne. In tandem with the launch Ms. Maria Leahy, a student of Oral History at the University of Limerick is commencing the recording of of the lives and times of those who lived along the line and of those families who grew up with the railway in their blood. Maria can be contacted directly at 086 4033707 or minzer@live.ie she will also be available at Listowel from 5.30pm and Newcastle West from 7pm on the launch evenings. The book, printed locally by Fitzsimons Printers, Shanagolden, Co. Limerick is published by the Great Southern Trail which is dedicated to preserving the heritage of these lines and the conversion to a ‘Greenway’ of the Ballingrane (near Rathkeale) to Tralee/Fenit route. As the book says: “the North Kerry had a reputation as a friendly line”. This was thanks to the railway community who worked on it. For the railway families and for the faithful supporters of the Great Southern Trail over the past twenty years signed copies of the book will be available at the launches at the very special price of €10. The post-launch price will be €15 which is still exceptional value for a scholarly work of 275 pages including over 30 maps/diagrams and over 80 photographs (many previously unpublished. For all who were associated with the working railway, all who now walk/cycle the developed sections and all whose interest is local history this book should be essential reading. Introduced by Éamon O Cuív T.D.